"Music is more than organized sound; it can be a message from the heart of humanity," according to Robert Stacke, Augsburg College associate professor of music. "Music can motivate a population in a manner that words alone cannot do. It is a powerful tool that can inspire political action and send its message to the world." Since 2010, political protests and revolts have erupted in more than a dozen Arab nations, and one of the American media's most significant impacts on the demonstrations came from a medium that is, perhaps, least expected. Rap, a music genre rooted in the United States, became an outlet for people to express frustration and discontent with their governments during the Arab Spring. This summer, Samantha Cantrall '14 [pictured] participated in an undergraduate research opportunity at Augsburg College, and she identified the influence of music on contemporary politics. "This relatively new and almost exclusively Western genre appeared in some of the most unexpected places of the world," Cantrall explained. "In the midst of these protests, music was clearly prevalent." Cantrall for 10 weeks conducted research through a grant from the Augsburg College Office of Undergraduate Research and Graduate Opportunity (URGO). URGO researchers are mentored by Augsburg professors who assist students with their proposals, research methods, data analysis, and final reports. 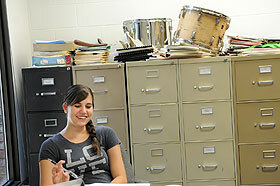 As an Augsburg Concert Band member and a communication studies major from Tomahawk, Wisc., Cantrall coupled knowledge from her degree program with her interest in music. Her research focused on rap music in the uprisings of Egypt, Lebanon, Libya, Morocco, Tunisia, and Yemen. Cantrall's adviser, Robert Stacke, is the chair of the Augsburg music department and a scholar who has studied revolutionary music in countries that include Haiti, Nicaragua, and Northern Ireland, which makes him the near-perfect adviser for this project. When most countries undergo political upheaval, "the revolutionaries have music that demonstrates or expresses their desire for change," Stacke said. As a mentor, Stacke introduced Cantrall to leading scholars in the field of ethnomusicology: the study of music in a sociocultural context. Cantrall's research chronicles the history of the Arab Spring through the hip-hop art form and succeeds in "capturing a musical idiom in words," Stacke said. While Cantrall's summer research is complete, she plans to investigate whether rap can sustain its popularity during peaceful times in Arab nations. She is applying for an additional URGO grant for the upcoming academic year and will work toward publishing her findings in a scholarly journal. Cantrall has analyzed news reports and has conducted interviews with members of Augsburg's diverse student body. "Interviews take this research further than just synthesizing other written material. URGO is more than just a term paper; it's true research and a contribution to the body of knowledge," Stacke said. Cantrall asked her peers to recount their first-hand experiences in Arab nations during times of protest. "In a personal interview, a student from Yemen claimed that chanting and drumming gave people something to do in the square while they waited to be heard," Cantrall said. Music gave the protesters a sense of unity, a collective voice, and an outlet to express their dissent, Cantrall said. "Although non-violent, there's a great amount of energy found in the lyrics of these protest songs," she said. "The energy could have been used [instead] to wield guns and bombs." In addition to speaking with fellow students, Cantrall interviewed journalist David Peisner of SPIN magazine. He published the article "Inside Tunisia's Hip-Hop Revolution" in August 2011. In order to write the article, Peisner visited Tunisia and spoke with the rapper El General, a musician who Cantrall featured during a post-research presentation. Peisner helped Cantrall understand why the Arab rap protest music movement became popular within multiple nations. According to Peisner, music became a reflective element of the uprisings because it expressed exactly what the protesters had been fighting for: freedom of speech. Cantrall became interested in rap music, in part, after hearing Dessa—a renowned rapper, singer, and writer—speak at the Nobel Peace Prize Forum held at Augsburg in March 2012. Dessa discussed some of the social and moral dimensions of hip-hop as a force for peace with the power unite communities in the presentation "Mic Lines: Art, Ethics, and their Contested Connections." The Nobel Peace Prize Forum is a learning experience that brings together Nobel Peace Prize Laureates, civic leaders, scholars, students, and other citizens with the mission of inspiring and engaging people to become full participants in peacemaking efforts around the world. And, as Cantrall discerned through research, "Rap has served as an alternative dissenting voice to oppose the violent fighting...it is the music of struggle, attitude, and simplicity." Learn about the Augsburg College URGO Summer Research Conference, held July 25-26. On-campus research is an opportunity for Cantrall—and other Augsburg undergraduate students—to develop research, analytic and problem-solving skills that are critical in graduate school, in professional study, and in the workplace.